Summer is all about fresh and zesty salads, long afternoons getting sandy at the beach and unwinding from the day with delicious food. My body (and digestive system) loves the variety and freshness of salads during the summer, the ability to get so many different flavours, textures and nutrients all into one colourful bowl – without spending hours in the kitchen but rather at the beach is always a win for me! I know that salads can get a bad rap, and I get it, I’ve had a few boring salads in my day – I’m looking at you iceberg lettuce! So to avoid a boring salad stereotype, I like to pack mine with as much variety as possible… variety of flavours and textures. This recipe is Gluten free, Dairy free, Meat free, Vegetarian, Wheat free, Soy free. Place all the salad ingredients into a large salad bowl. Use your hands to gently mix ingredients together and set aside. Add the dressing ingredients into a jar or bowl and mix together. Taste and adjust as needed – add a little bit more lemon juice, or honey as needed. Set dressing aside until ready to serve. When ready, preheat BBQ or pan and cooked salmon. Start cooking the salmon skin side down with a little olive oil and cook through. Turn and cook salmon from other side. 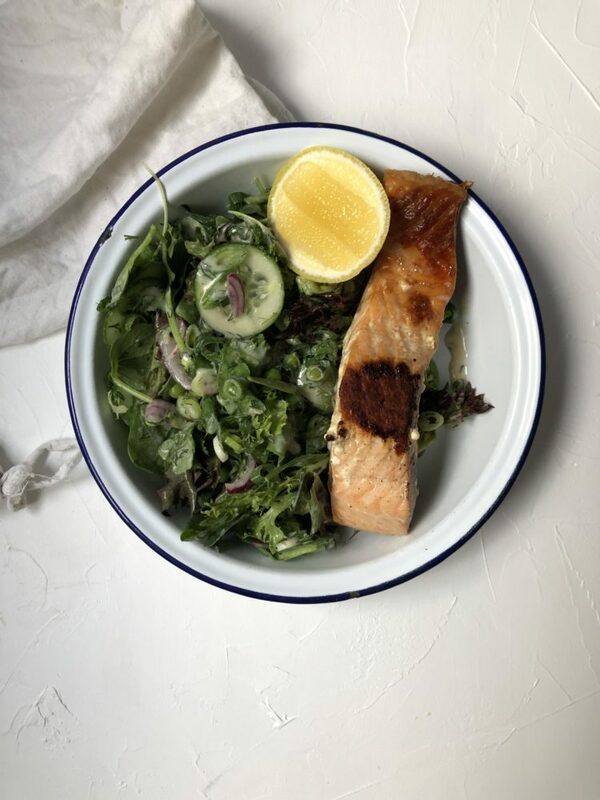 Dress salad, mix through the salad and serve with the freshly cooked salmon.